From the reign of Henry II, the village was owned by the Starkey family, who lived in Lower Stretton. 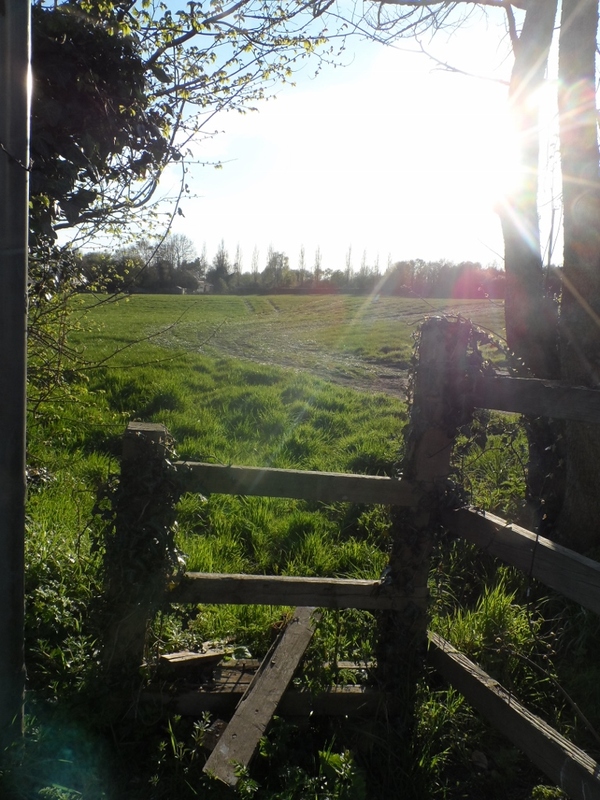 An ancient chapel of ease was situated near Tanyard Farm in Well Lane, where there is a field named Chapel Field, accessed through “Chapel Stile”. The church was built in the 13th or 14th century for Starkey family worship. This would have been convenient as it was situated between Stretton Hall and Lower Hall where different branches of the Starkey family lived. The chapel was referred to in the will of Richard Starkey in 1527 as the Oratory of St Saviour, to which he bequeathed money for a “new steeple for a greater bell to be rung for the services.” It was thought to have had a wooden steeple and stained glass and was said, by Sir Peter Leycester, to have been ‘very ruinous’ in 1666, although it is not known why. Today there are no remains, however many sandstone blocks along the side of the lane and in local gardens indicate the fabric of the church. See below for some thoughts of a former resident of Well Lane as to where he thought the chapel might have been situated. In 1827 a new church was built, dedicated to St Matthew. 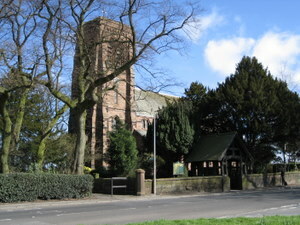 St. Matthews was originally a chapel of ease to save people travelling each Sunday to Great Budworth. It was funded by the Church Building Commissioners and described as “an uninspiring Gothic structure with a tower”. The first stone was laid by Thomas Lyon of Appleton Hall on 23 November 1826. Thirty years later in 1859, a chancel was added under the direction of the famous architect, Sir George Gilbert Scott. The first vicar of Stretton was the Reverend Richard Janion, but he was superseded by Richard Greenall after just four years. Richard Greenall held office at St. Matthew’s from 1831-1867 first as a perpetual curate then the vicar, Rural Dean of Frodsham, and finally Archdeacon of Chester. There are six bells, which were purchased by public subscription and installed in December 1850. There was a report about the first peal in the Manchester Courier. Upon the sudden death of Archdeacon Greenall in 1867 the church was rebuilt, again under Scott, as a memorial to Greenall. There is an excellent guide to the history of the church on St. Matthew’s church website by David and Margaret Hart. Rev. Richard Janion 1828-1831 – see newspaper report of his tragic death from a falling branch of a tree walking home from a church meeting along Wilderspool Causeway. Rev. Richard Greenall 1831-1867– His mar­riage with Eliza, the daughter of Thomas Lyon, of Appleton Hall, brought him the living of St. Matthew’s, the patronage being in the gift of his father-in-law. The Rev’d Geoff Buchan has researched the wide ranging influence of Richard Greenall. Rev. Henry Russell Dodd 1868-1896 – see report from The Cheshire Observer Saturday September 26 1896 reporting from his trial where he was found guilty of ‘immoral conduct’ towards three local women and subsequently dismissed. Rev. Hon Charles Francis Cross 1897-1937. Just two months after the dismissal of Rev Dodd, a new vicar was appointed, having tendered his resignation at Shotwick. Canon Cross is remembered as a kindly and extremely generous incumbent with stories of giving away is living room carpet. Peter Hall has researched the Curates of Stretton who performed many of the church services and played a vital role in the life of the village. Peter has also undertaken a huge amount of work into the Churchwardens between 1848- present at St. Matthews, some of whom lived in the village of Stretton. In 1931 a new vicarage was built next to the church where it still stands and the original, built a hundred years before in 1831, became a private residence. In 1939, Henry David Lloyd was residing there. The old vicarage now forms part of The Park Royal Hotel. This was built around 1770 and the small building in front of the primary school is now used for meetings and a pre-school. It was originally known as the Appleton Hall Stables having been given by Colonel Lyon. I was interested to come across this website about Stretton village where I lived from 1957 (aged 6) until 1981, when I moved to Antrobus. I was particularly interested to see the reference to the Church of St Saviour in Well Lane. I believe that it was sited where Tanyard Farm House now is. This was built late 17th / early 18th century. I was always told that there was a chapel of ease somewhere in the near vicinity of this farm house, but no one was quite sure of its exact whereabouts. However around 1967 (I was aged about 16) I was laying stone flags to cover the area between the front of the farm house and Well Lane (they are still there) and I had to dig out a depth of about a foot to be able to lay a particularly thick flag. Doing this, I uncovered what we all thought were the two sandstone base stones into which large doors would have been pivoted. The pivot holes still had evidence of the metal (lead?) in the holes that would have gripped the pivots on the bottom of the doors. These sandstone threshold stones were just outside the front of the existing farm house, to the left of the central front door, if I remember correctly. They are still there, buried under the flags. We decided that they were probably the doorway for the chapel of ease. If you walk down Well Lane towards Moss Hall Farm you will go round a right hand bend about 100 yards after Tanyard Farm House. On the right there used to be a tiny one up – one down house with an attached shippon for a couple of animals and loft above, all configured in the one small building. It was called, very grandly I used to think, Dandycock Hall. It was tiny!! I pulled it down around 1970 as it had become derilict and its small yard was incorporated into the field. I think evidence of the yard would still be there under the turf in that corner. I seem to remember being told that there had been two small cottages a little further along Well Lane after Dandycock Hall, but on the other side of the lane, but they were pulled down long before my time. Just opposite where these cottages were supposed to have been is now the terrace of three little cottages known as Tanners Row, and is where the tannery workers used to live. The pond in the garden of the end one is where the hides were soaked as part of the tanning process in days gone by (hence the name Tanyard Farm). Going back up Well Lane from Tanyard Farm House there are two new (1970’s!!!) houses on the left. They are built on the site of what turned out to be a very old timber frame house that we demolished around 1967. Its roof was asbestos sheeting which had been put on as a repair in the 2nd World War. Its original roof had been blown off by a stray German bomb which landed in the field opposite. Apparently the bombs had been intended for targets in Warrington but were jettisoned early. The age of the house was not realised until we had begun its demolition, when we found it consisted of timber frame with brick infill. We also found what was obviously a much older part under the stairs where the wall under the plaster was still made from wattle and daub. We managed to extract that “slab” of wattle and daub intact and took it to the Warrington museum. I have no idea if it is still there, or if it ever went on display. Perhaps I should make enquiries!! At the top of Well Lane on the right are what used to be the shippons for Lane End Farm. These had originally been a row of cottages, which were turned into the farm shippons when the farm was put together as a farmyard sometime in the 1930’s. The farm house had originally been a butchers and the small outbuilding in the yard opposite the cottages had been the slaughterhouse. On the opposite side of Northwich Road to the entrance to Well Lane there had also been a row of cottages that had been demolished sometime around the middle of the last century. The whole area had been quite a thriving village. My great great grandfather Peter Jackson 1788 – 1865 was buried at St Matthews Ch. are there still gravestones of that time still standing? I lived in Appleton when young and was “required” to attend the Sunday School held each week in the old hall probably between 1963 and about 1968. Mostly happy times but walking across the fields from Pewtespear Lane when the weather was rough was less than enjoyable!